In my last post, I talked about how to teach a communication response to replace escape-related challenging behavior and had a protocol for teaching a break response as one of the options. I wanted to take some time today to talk about what a break might actually look like. As I noted in that post, the type of break and what happens during a break can vary as much as all our different students. A break can take place in the same place as the activity the student is asking to escape. Typically this would make sense if the student is escaping from work. For instance, I had a student who would ask for a book and his mother made the astute observation that he was really asking for a break because although he stayed at the desk, he shut us out when he got the book. That was enough of a signal for him (and us) that he was released from work when we gave him a book. For other students or situations, though a break needs to be away from the activity to really indicate a break for the student. For instance, if your FBA hypotheses indicate that the student’s behavior serves to escape from the cafeteria (presumably because of the social and sensory demands of the environment) leaving the environment is going to be important. So, let’s look at some characteristics of breaks that might be useful to consider depending on the hypotheses of the behavior and the student involved. Let me repeat that. A Break is NOT Time Out. And one more time for good measure. A Break is NOT Time Out. Yes, I’m perseverating, but for good reason. We are trying to get the student to make a request. I don’t know about you but I don’t regularly ask for things I DON’T want. A break has to be something that the student likes. It doesn’t have to be something he LOVES, but it does have to involve removal of the antecedent to the challenging behavior and be a pleasant experience that the student would want to engage with. Time out is a punishment we use to remove the student from a desired reinforcer or activity in order to extinguish a behavior. A break is something that we take when we need some time away. A coffee break. 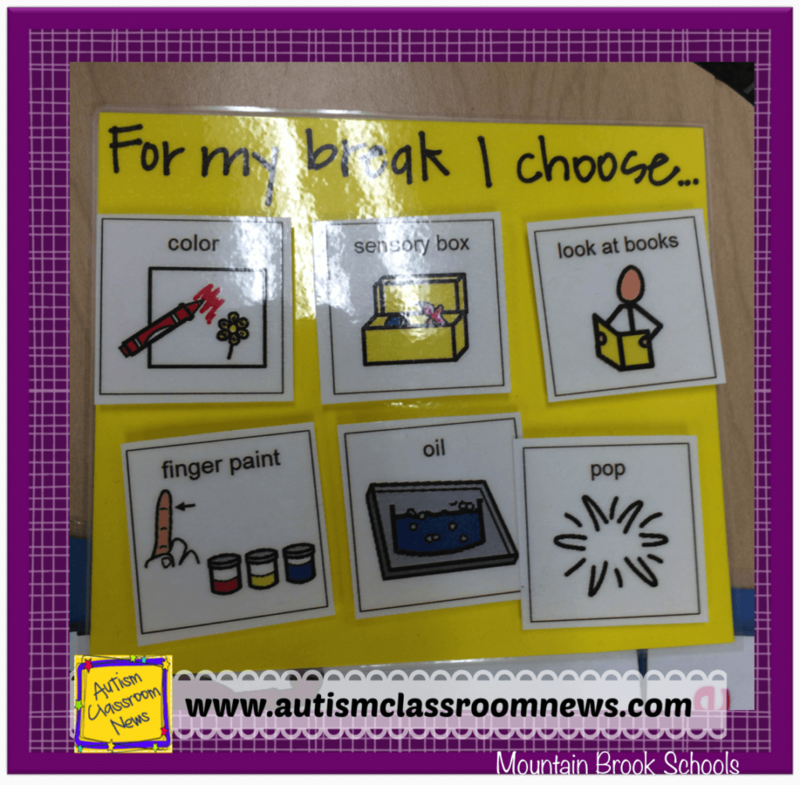 A brain break. A lunch break. A bathroom break (which, let’s face it, aren’t always to use the bathroom–for us and for our students). We don’t put ourselves in time out; we take a break. Sometimes we just need to step outside and take a moment to pull ourselves together. That’s a break. So, make a break appealing and something that the student likes (like the Dora blanket above). You can limit breaks in the future, but remember that first the student has to learn to ask for the break, then we can teach him to wait for one. 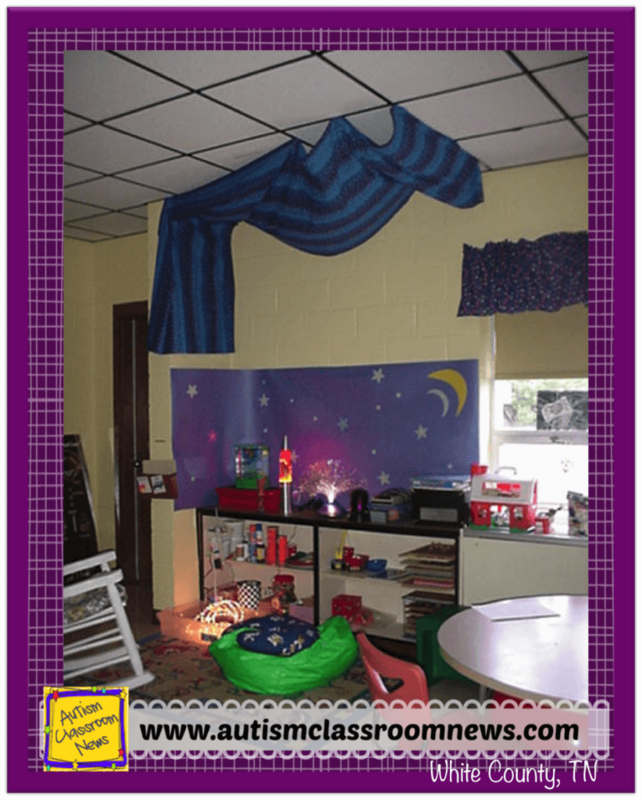 You don’t have to create a specific break area in your classroom. You might have a book corner or a leisure area of your room that will work fine for a break area. 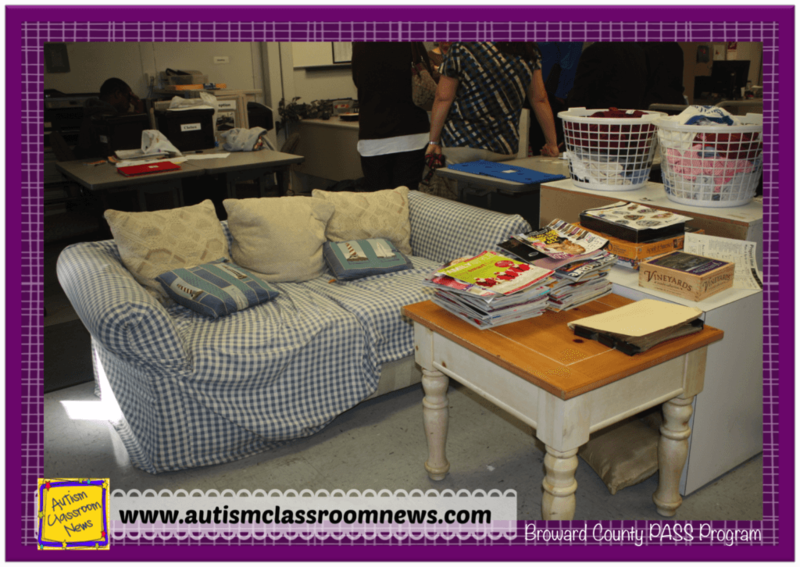 This is a leisure area with magazines and books in a high school transition program. I used to have a high school student who worked for a break that was to lie on the couch and choose the music she would listen to. She would lie down and say, “How ’bout Lion King” or whatever her choice that time was. We set a timer for 3 minutes and the music was turned on as soon as she asked for the break (at the start of the program). We gave her a 1-minute warning before the break ended and then turned the music off at 3 minutes and she had the opportunity to start work or ask for a break again. 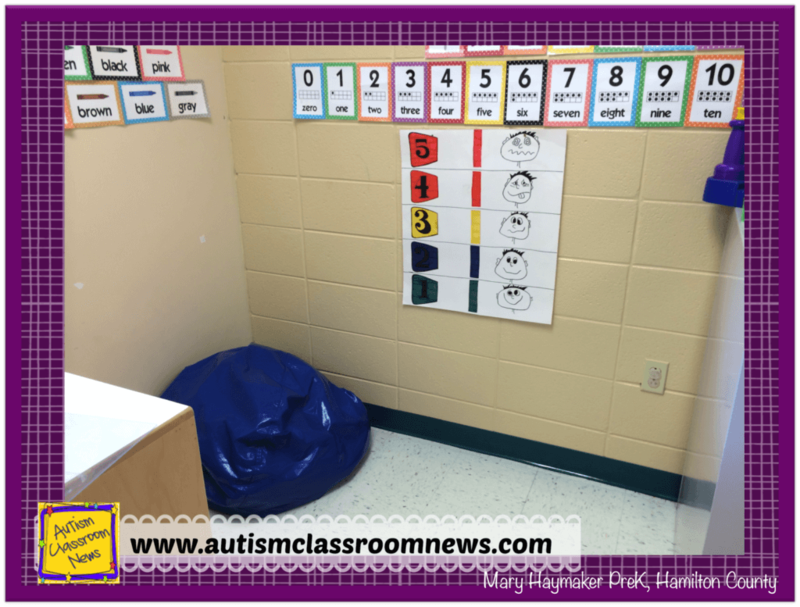 This other picture is a sensory area we set up in a classroom for students with multiple disabilities. Some of the students were in wheelchairs and severely disabled. They were working on switch use to activate devices in the sensory area. 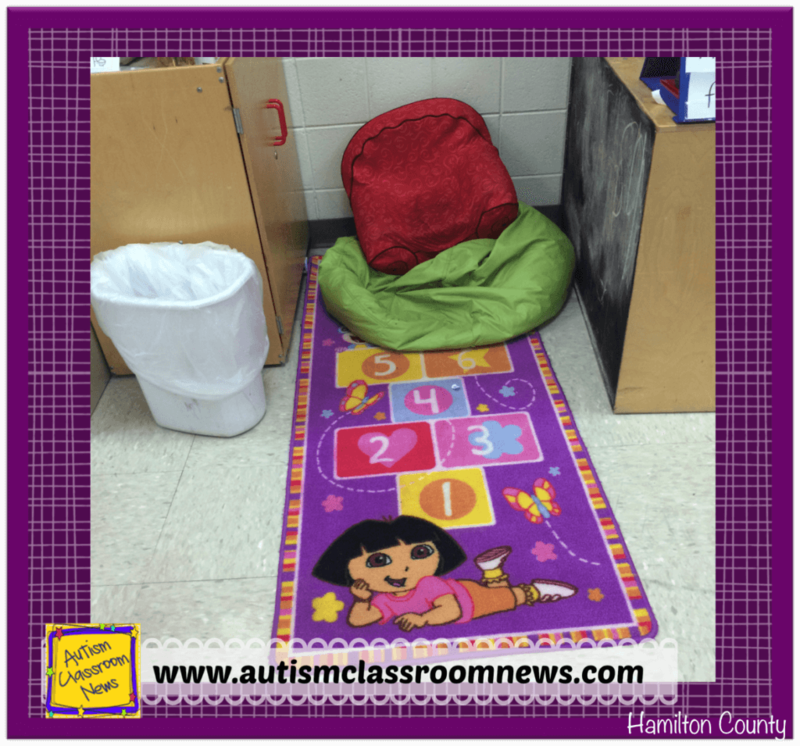 Other students used the sensory area as the break area to sit in the bean bag or rocking chair to chill. I’ve had some students who really benefit from the opportunity to swing or do other calming activities during a break. Their breaks can sometimes consist of the opportunity to swing. 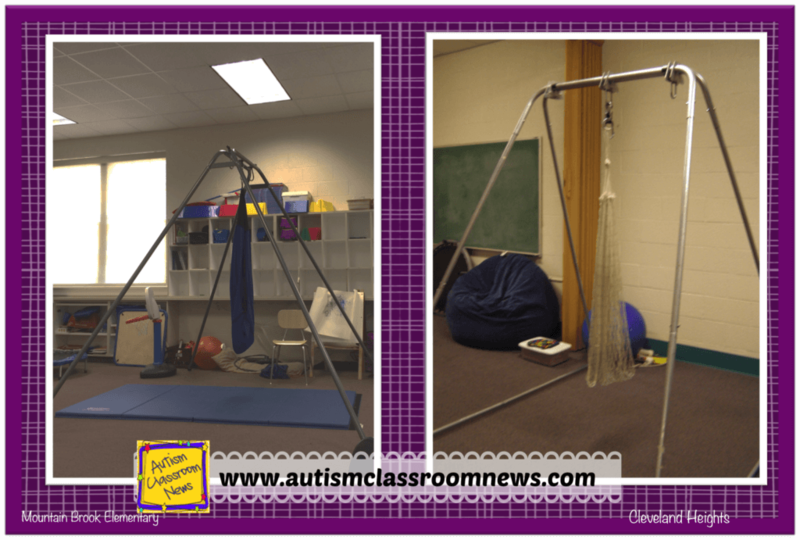 These swings were both highly appealing to students because the net or cloth encompasses the student as they swing. One of the guys likes to take his break with an adult attending to him. When we gave him breaks in which he was left on his own, the challenging behaviors typically continued in the break area. He likes an audience so his break consists of someone pushing him the swing and playing music or talking to him. His challenging behavior, based on the FBA, is typically escape motivated, but gaining attention was a secondary function, so he needed a combination in his breaks. Gradually we can fade the attention part out and he can now handle small amounts of work before taking his break. 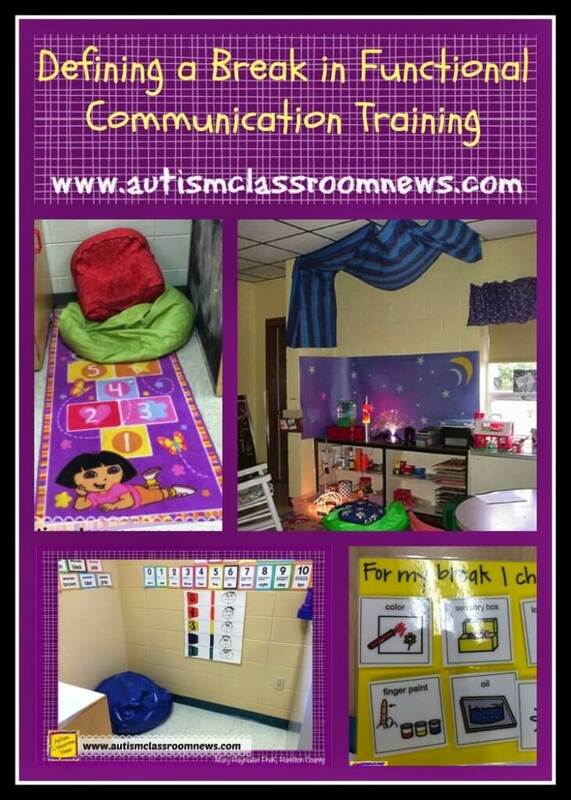 We have a whole course in the Special Educator Academy on Functional Behavioral Assessment and Behavioral Problem Solving and a workshop specifically on Functional Communication Training. Come find out more! Breaks don’t always have to be the same. Sometimes breaks can be mixed up. The advantage of using a visual choice board is not only in the visual representation of the choices, but you can change the menu. If a specific break isn’t available for some reason (e.g., you decided you didn’t want the highly preferred activity to be the break EVERY time; something isn’t available). You change the menu and you set the parameters. Just remember that the choices have to be something he or she likes. This student liked to finger paint and sometimes had that opportunity. Other times he had the opportunity to play with oil in a zip lock back on a cookie tray or pop bubble wrap. These are not his absolute favorite activities in the world, but they are things he enjoys and that he can engage in for short periods of time. This is a break corner that has a 5-point scale for the student to rate his/her state at the beginning of break and after the break. He knows he is ready to move on when he is at a 1 or 2. He needs to already be able to use the 5-point scale and engage in activities that help him calm down in order for this to be effective. Again, if he is asking for a break, you shouldn’t send him here as a punishment. You don’t want the two to get confused. How long a break lasts and what it looks like all depend on the needs of the student and the situation. Your FBA should give you some information about how to make decisions about what it should look like. Remember that you want a break to be reinforcing since that’s what the student is likely to ask for. And for some students, and in some situations, a break might be going to get a drink of water or walking it off during a baseball game. We all take breaks and typical kids take breaks. The difference for some of our students with ASD is that they don’t know how to ask for that break and their challenging behavior can serve that purpose. The focus should be on how to increase the communication while decreasing the NEED for the challenging behavior. Do you have a break area in your room or do you have other areas that you use for breaks? Share in our private FREE Facebook Group! This post was part of the 5 Steps to Meaningful Behavioral Support series. Click here for the rest of the posts. Helpful Behavioral Resources (Amazon Affiliate Links). *same price for you, but a small commission for me. I only recommend things I use myself.